It’s here! Granite Industries is setup at MATRA in Hershey, PA! This morning Granite CEO, Matt Wyse, featured two new products in the New Product Demonstration. Granite is continually developing new products and improving designs on old products. This can be seen with the introduction new products from the Granite family, Overland Electric Carts and American Cart & Equipment. The first new product is the Overland Electric Powered Stage Platform Cart. The other new cart comes from American Cart & Equipment. The Stackable Chair Cart is an industrial chair chart designed for heavy use and maximum productivity. All carts are designed, manufactured, and assembled in the Ohio Plant by local workers. Overland electric carts have completely invented and defined a new market segment. Featuring an all electric drivetrain powered by rechargeable batteries, these electric carts emit zero emissions and are nearly silent. Electric power provides instant full power at the twist of a throttle. There is no waiting to hit a power band or changing gears. The chassis on this particular cart is an Overland standard chassis. Overland has developed a custom attachment that perfectly handles 4′ x 4′ stage platforms. Load up to 750 lbs of stage platforms and effortlessly drive away. It is compatible with other options such as the 9 cu. ft. Brentwood bucket, or flat platform. 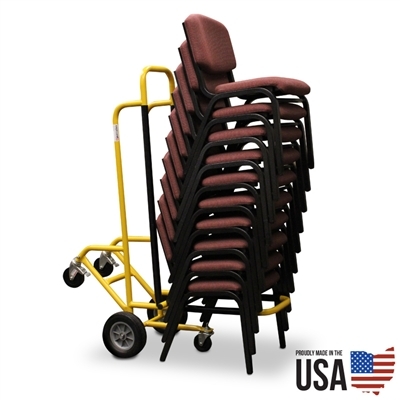 The American Cart Stackable Chair Cart is a new twist on an old design. One of American Cart’s best selling carts is the Chiavari Chair Cart. American Cart kept getting requests for a stronger version capable of handling a different style chair. Thus the Stackable Chair Cart was developed. Built from 1-1/4″ steel tubing and finished with a Granite yellow powder coat, this cart is built for heavy use. Rear wheels make moving 10 chairs a breeze. Simply load the chairs up, tilt the cart back and wheel them away. Handle up to 500 lbs. Be sure to check the exclusive specials at MATRA!